The black garden ant is the most common and is found in almost all parts of the country. The Workers are about 5 mm in length and dark brown almost black in colour and the Queen is about 12 mm long and lighter in colour. The queen usually lays her eggs in late spring which take approximately 3-4 weeks to hatch into larvae and a further three weeks to reach the pupate stage, These will then hatch into worker ants and these are the ones that will become the problem pest. During July to August you may notice a presence of winged ants. These are both male and female ants – they mate during flight, after which the male dies and the female sheds her wings and digs a cell in the soil where she will stay until the following spring and the cycle will then again continue. 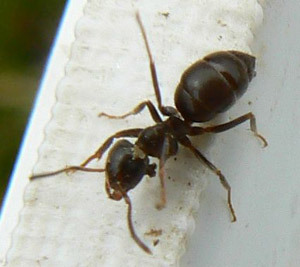 Foraging worker ants cause a nuisance as they travel widely in search for food, usually following well-defined trails and clustering around a food source. In the garden they will excavate and mound soil around plants and in lawns. Ants may cause considerable nuisance occasionally invading food prepared for human consumption. In many cases where ants are a problem indoors it is because they have either established a nest beneath the foundations or very close to an outside wall and are finding their way into the building. To control ants under these circumstances either apply a contact insecticide, such as ant powder, or use a gel, which the Worker ants feed on and take back to their brood within the nest. If persistent, the gel may eventually destroy the nest. If you decide to use a powder it should be applied to cracks and crevices along and under skirting boards where ants are a problem. If you suspect you have an ant infestation in Edinburgh, Glasgow, Aberdeen, Dundee or Perth, call GRAHAM pest control today and we could help.